We are sending off SMS confirmations for the next 2 days’ appointments and also updating the health engine of available times (this is an online appointment system). Cleaning of instruments and the running of the autoclaves are constantly being done to ensure there are sufficient instruments available to the dentists and nurses when required. In the mean time I am being summoned one thousand times to help in the surgery because I think Dr Seymour has forgotten everyone else’s names. (Editor’s note: I do remember other people’s names, it’s usually “Ladies, some assistance please” as I sometimes need two nurses to help me with a procedure, but this is Roni’s article, so I won’t say anything to defend myself). The nurse’s change is then done so everyone gets a break. Had to pour up models and call the technicians for a pick up, and there’s more… then attend to payments, patient enquiries on the phone, the practice checklists of duties to do by the day’s end. Also other types of payments such as child dental payments, phone calls, walk in patients, appointments, Department of Veteran Affairs online payments and Fee For Service voucher paperwork if required at the time. The team rotate around doing all the duties, but we all help each whenever the need arises. Woo hoo time to start rotation of lunches and have a well-earned break. I can still hear in my head, Dr Seymour calling for me. I need to eat! Lunch rotations continue and available nurses are all hands on deck. The sterilising room is still in full motion. The appointment SMS log is checked and those who have not responded are called to make sure they will be attending their scheduled appointment; this can become very time consuming. It’s now my turn to assist Dr Seymour, while the other nurses continue to make appointments, attend to walk in patients and pour models. I have to save images and set up the x-rays on computer for Dr Seymour. Then for the next patient, collect instruments for certain procedures (e.g. surgical extractions, implants, wax knife for dentures and impressions trays for models and the list can go on). For another patient I mixed materials that will be placed under a filling. We often print out of blog articles as information sheets to reinforce what Dr Seymour has explained to the patient. This is then entered into their notes. As the instruments are barcoded and labelled, they are shown to the dentist to check that the indicators have changed. Once the packet is opened, the unique barcode is scanned into the patient’s notes on the computer. I then record work to be done on the patient’s chart. But the most important part of the job is the patient. I enjoy bantering with the patients and Dr Seymour. This can be fun as we learn more about each other and our opinions on what’s going on in the world at that time. This is often the highlight of the day. We have got to know patients over many years and we see them go through highs and lows. Understanding this allows us to help people better. 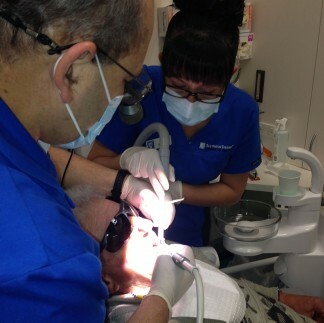 I want to make the patients feel that they are not at the dentist, and they are comfortable and at ease. Now it’s time to get my fingers wet with suctioning and retracting any part of the mouth that will give better vision to Dr Seymour to do his procedure. Once we have completed this patient, we need remove the tray to the sterilising room and then clean and wipe down the surfaces with a disinfectant before the next patient is allowed in. Dr Seymour, please wait! He has no choice but to wait, as he knows how important this step is, and also because I said it! Whilst there are so many things I haven’t listed nothing is ever as simple as it sounds or looks and nothing is ever a 5 minute job. The job of a dental nurse can be a challenging one. We are in constant contact with patients. We must put your interests first and use our ability to help you when we can. We encourage you to ask us for advice or information. We are qualified to a standard, and have enough experience that we are able to answer most questions. Those we cannot; will be referred to the dental professional. Next week: A day in the life of a Dental Nurse – Roni – Part 3 – Afternoon, Evening and End of the Day!